I have been following the Twin Rinks proceedings, obviously the bonding issues were settled to where Wang could complete his purchase, and open a pro shop plus put the Islander logo on the marquee. The question is does John Ledecky/Scott Malkin want the team to practice there next season when they are majority owners? 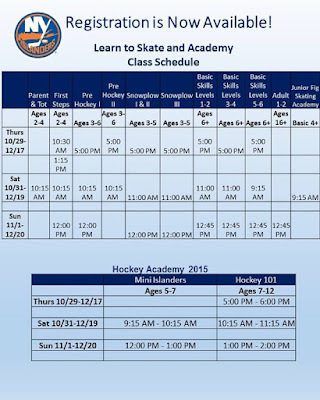 If Wang wants to change practice routine to this facility from Iceworks, obviously he can, same as he intended to do with Cantiague Park on 12/31/15. Seems some Islander branding has happened. Remember the postings early in summer here about changes at Iceworks, Bob Thornton? Seems Miro Satan will be there too, expect Radek Martinek if he still lives here. Twin Rinks will host the Elite Hockey Group clinic every Friday 5:45-6:45pm. $40 cash or check for elite level Midgets, Bantams, Peewees and Squirts. Coaches include: Bob Thornton, Miro Satan, Eric Conway and Alexis Moed.